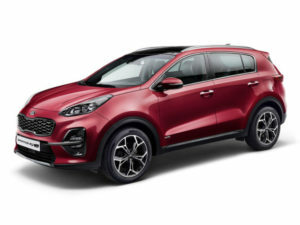 Kia has unveiled its refreshed Sportage, which will gain a mild-hybrid diesel drivetrain as well as new technologies and a fresh design. On-sale in Europe during Q3 2018, the brand’s UK and global best-seller will launch an EcoDynamics+ 2.0-litre diesel mild-hybrid that will, as outlined by Fleet World, bring increased efficiency – Kia said it can reduce CO2 emissions by up to 4% on the Worldwide harmonized Light vehicles Test Procedure (WLTP) – while proving significantly cheaper than full hybrid drivetrains. The unit is small enough to be integrated into existing vehicles and drivetrains, and marks a further step forwards for the company’s electrification plan. The revised powertrain line-up also includes a new 1.6-litre diesel that replaces the Sportage’s existing 1.7-litre CRDi and will be available in 113 or 134bhp variants, the latter available with all-wheel drive and seven-speed double-clutch transmission. All powertrains will be fully compliant with the Euro 6d TEMP emissions standards. The updated model also brings enhancements to the design – including new front and rear bumpers – as well as upgraded infotainment and active driver aids and modifications to ‘GT-Line’ models. European customer deliveries of the new model will start during Q3 2018. On-sale date, pricing and specification will be announced closer to the launch.